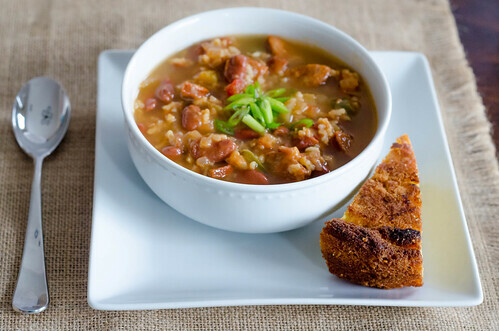 Red Beans and Rice has long been one of my favorite meals - my mom used to make it quite often when I was growing up as an easy vegetarian meal - sans andouille sausage, of course. I posted a really awesome version a few years ago, but it's a recipe that you have to plan ahead for - soak and cook the beans, etc. I also have been majorly slacking in the meal-planning department as of late, so I usually spend a good chunk of the afternoon trying to decide what to make for dinner based on what we have on hand. Enter this soup. The weather's been cold, we've all had colds, and I was craving something hearty and comforting, but still somewhat light. And one of the best things about this recipe is that it's all made in one pot - sauté the chicken sausage, cook the onions and peppers, then dump everything else in (rice too!) and let it simmer away. The finished soup is hearty and filling, spicy, and oh-so comforting. Joey and I both loved it, and while it was a tad too spicy for Caroline and Smith, I toned it down with a little Greek yogurt, and they were fine. And you MUST serve it with cornbread. It's not even optional. Heat the canola oil in a large pot or Dutch oven over medium-high heat. Place the sausage in the pot and cook until nicely browned, stirring often. Remove from the pot with a slotted spoon. If there is an excess amount of fat, drain it from the pot. Reduce the heat to medium, and add the onion, bell pepper, celery, and half of the Cajun seasoning. Cook, stirring frequently, until the vegetables are soft, about 5-7 minutes. Stir in the garlic and cook until fragrant, about 1 minute. Add the diced tomatoes, broth, bay leaf, remaining Cajun seasoning, and kidney beans into the pot. Return the sausage to the soup and bring to a boil. Place the brown rice in a small mesh strainer and run cold water over it until it runs clear, about 30 seconds. Add the brown rice to the soup, and simmer over medium-low until the rice is cooked, about 35-40 minutes. Season to taste with salt and pepper. Ladle into bowls and top with sliced green onions. This is going on my menu next week. Looks awesome! Yup, going to be trying this as well. I made a version of this and used Barley instead of beans. but we're all bean-loving, so I'm sure this will be a winner in our home!Thanks Josie! This sounds like a hearty soup. I will add this to my list. I'm making all the soups I want to try this month. Easy on the budget and most of them "good for you" food. Thanks. Red beans and rice always goes on my menu in January. It's a perfect meal to take away the chill. Thanks! I'm really looking forward to making this one. I love red beans and rice - but it's kind of a process. Adding this to our menu soon! I'll have to try to get my arms on some veg andouille but this appears to be like such an excellent tasty meal! Plus I really like that it gives me a purpose to create cornbread This appears to be like a satisfying broth. I will add this to my record. I'm creating all the sauces I want to try this 30 days. I made this for dinner last night, and I'm having it for lunch today as well. Great recipe. Thanks for sharing!